As a youth pastor, I frequently ask teens what they want to discuss. Often, teens – both men and women – will suggest we discuss women of the Bible. For the most part, teens feel as though they know the stories of the male characters in the Bible better than that of the females. Because I teach on this often, I’m always looking for resources that help me to engage with these characters in new ways. For that reason, I was excited to read Latan Roland Murphy’s Courageous Women of the Bible: Leaving Behind Fear & Insecurity for a Life of Confidence and Freedom. In this book, Latan explores the stories of 11 women from Scripture, including Jael, Jochebed, and the Shunammite woman from 2 Kings. She does so specifically through the lens of courage – exploring how each of these women demonstrate courage and extrapolating what that might mean for women today. Despite these positives, I would have liked to see more exegesis in Latan’s work. It felt like each chapter focused far more on the character’s relevance to today than on actually contextualizing that character’s story or shedding new insight on it. 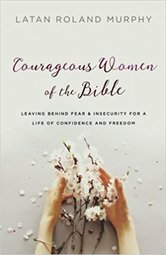 Even so, Courageous Women of the Bible would make a great resource for a conservative women’s Bible study. Given the personal nature of the discussion questions found at the end of each chapter, it would work particularly well in a group that’s known each other for a long time. It's my pleasure to give away a copy of Courageous Women of the Bible today. To enter to win this copy, leave a comment sharing a woman from the Bible who's given you courage. A winner will be drawn on Sunday, June 17. Disclosure: I received a free copy of Courageous Women of the Bible from the Blog about Blogger Network in exchange for a fair and honest review.